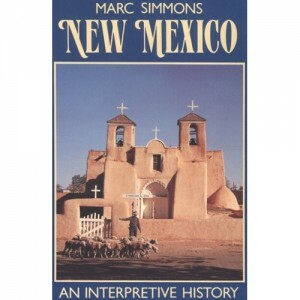 Originally written as part of a Bicentennial project which produced books on all 50 states, New Mexico: an interpretive history was re-published in 1988 with a new introduction by the author. More than an overview of centuries of New Mexico history, the book offers readers an account of the unique mingling of cultures which makes our state unique. Chapters are devoted to the main cultural groups which shaped New Mexico — the Pueblos, the Spaniards, and the Anglos. Simmons is the author of over forty books, and writes frequent journal and newspaper articles on various topics in New Mexico history. This volume gives those who are new to the state’s history, as well as those who know its history intimately, a highly readable and enjoyable account of the forces, both in nature and in society, which created today’s Land of Enchantment. This volume is intentionally brief, a criteria for the Bicentennial project was for a work of about 200 pages, but it contains much useful information, along with suggestions for further reading. Another work by Simmons, Kit Carson and his three wives: a family history (UNM Press) gives a rare account of the personal life of one of the Southwest’s most famous, and infamous, characters. Simmons focuses not on the major events which Carson is known for, but on his family connections. It’s a useful book for figuring out the Carson and Bent family genealogy questions which seem to arise frequently. Many other books by Simmons are still in print and will fill out any Southwest history collection nicely. A lecturer, scholar and historian by trade, Simmons’ works are thoroughly researched and documented. But perhaps his greatest contribution to New Mexico scholarship is that he makes Spanish Colonial history accessible and understandable to the non-historian, general reader.